Depending on your point of view, Abraxas is either an Egyptian Sun God who was adopted by the early Christian Gnostic's, or a demon from hell who is closely associated with Lucifer, although there is a case for the former, since he was not demoted to the ranks of a demon until the Middle Ages. Abraxas was no ordinary god, however, As ruler of the first Heaven he had dominion over the cycles of birth, death and Resurrection. drawn by four horses; these horses represent the elements. 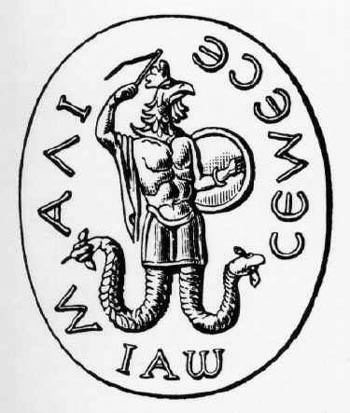 This Abraxas symbol was adopted by the Knights Templar, who used it on their seals. No one knows precisely why this symbol was of particular significance but the hidden secret within the name Abraxas may provide a clue. In Greek the 7 letters are the initials of the first 7 planets in the Solar System. Further if we apply numerology to the name then it adds up to 365 not only the number of days in a year but also the number of the spirits that those same early Gnostic's believed were emanations from God. Added to the mix is the speculation that the supreme magical word Abracadabra may derive from the name Abraxas which means "harm me not"
I would like to know what do those words mean. what numerology do you mean?